I made an Magic Inch quilt in 2017 for the charity arm of our local quilt guild. It was based on a design by Weeks Ringle and Bill Kerr. I wrote a blog about making that quilt earlier. 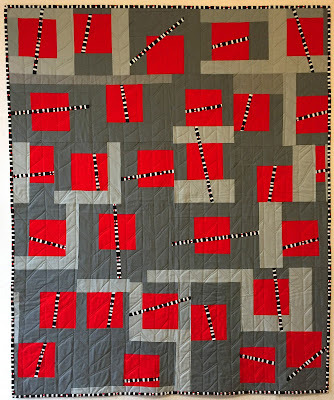 At that time, I also cut out some red squares and black and white strips for a second quilt. Since then, however, I decided that I would modernize this design and make it totally improvisational. 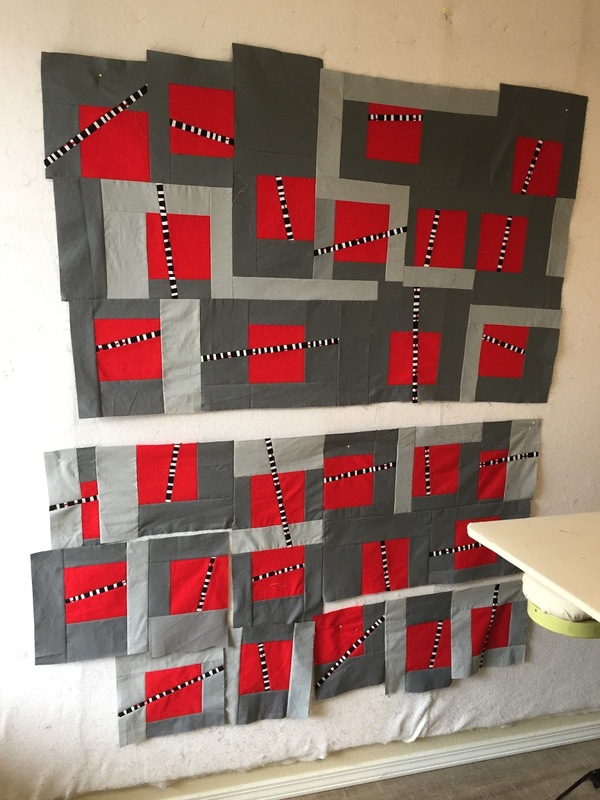 So, I cut through some of the red squares and inserted the 1" strips. Then I added some borders and inserted strips in some of the rest of the pieces. I used 3 different grays for the background and just made up all the blocks. I placed them on the design wall willy nilly and moved them around until they looked very random. Sewing this together wasn't that easy, as I had really odd spaces to fill and partial seams to sew. But I liked the improv nature of making this top. And here is the completed top. I hope you can take a step into the unknown and put together a top intuitively. It is a wonderful quilt. So bright and fun! I'm working on the intuitive part. . .Maybe it will come to me.